From its nine-million-pound cast-iron dome to the dazzling opulence of the President’s Room and the Senate corridors, the U.S. Capitol is a triumph of both engineering and design. But its history is also the history of America’s most tumultuous years. 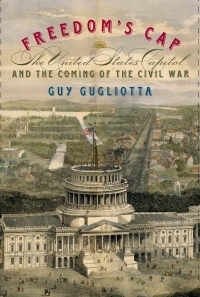 In Freedom’s Cap, Guy Gugliotta recounts the history and broader meaning of the Capitol building through the lives of the three men most responsible for its construction: Jefferson Davis, who remained the Capitol’s staunchest advocate up until the week he left Washington to become president of the Confederacy; Davis’s protégé and the Capitol’s lead engineer, Captain Montgomery C. Meigs, who became quartermaster general of the Union Army and never forgave Davis for his betrayal of the nation; and the Capitol’s brilliant architect and Meigs’s longtime rival, Thomas U. Walter, who defended slavery at the beginning of the war but eventually turned fiercely against the South. All sessions take place in 523 Butler Library, 6:30 – 8:00 p.m. unless otherwise noted. This entry was posted in Uncategorized on March 7, 2013 by cl880.